Now that 2009’s drawing to a close, I’d like to take a moment to honour three unsung heroes of the Singapore theatre scene. You see, this year marked the 25th anniversary of the founding of our country’s very first professional theatre company, ACT 3: a name inspired by the fact that it was founded by three friends, R Chandran, Ruby Lim-Yang and Jasmin Samat Simon. As many of you know, ACT 3’s a children’s theatre group – a fact that’s occasionally caused it to be completely left off the official record. Too often, it’s claimed that TheatreWorks was the first professional group, though it only came along in 1985. “Maybe we should take more credit,” jokes Chandran, whom I interviewed at the Esplanade, between rehearsals with his company ACT 3 Theatrics. He tells me he’s especially proud of how the original theatre group developed the local arts scene by giving so many young people their first introduction to drama. “There are parents who take their children here and tell me, ‘I remember you when you came to my school and performed. I want my children to enjoy what I enjoyed as a young person,’” says Lim-Yang, whom I interviewed over e-mail. She runs ACT 3 International, the other offshoot of the first company. Then in 1979, the three of them met at a workshop for writers and actors run by Radio and Television of Singapore. All had full-time jobs: Simon was in an advertising company, Lim-Yang was a product manager for a marketing firm, and Chandran was an accountant-turned-copywriter. Still, under the guidance of producer Clarke Trent, they used this opportunity to create some of the Singapore’s earliest English TV shows for children. Unfortunately, this didn’t work out for long, because RTS decided to focus on making shows in Mandarin. Nonetheless, the three had by now discovered they had a shared passion for children’s theatre. Thus, in November 1981, they banded together to form ACT 3 as a part-time company. Their first shows were held on the third floor of the old MPH bookstore near the National Museum. Kids came in for free over five weekends to watch fairy tales like “Little Red Riding Hood”, “Jack in the Beanstalk” and “Hansel and Gretel”. Later shows happened at birthday parties, sports clubs, beaches and public parks – pretty much anywhere but a proper theatre. Usually, Chandran says, one actor would play the part of the main character, while the other two played multiple characters – for instance, in the perfomance of one Japanese folktale called “Taro the Dragon”, he had to act as twelve different people, each with a different voice. Everything was about close-quarter acting, feeding off the children’s hunger for participative theatre – although this meant that once, while playing the Big Bad Wolf, he nearly got stabbed by a child with a fork. And as time went on, the three founders soon discovered they had great complementary skills. Chandran was the ace playwright, Lim-Yang was an arts management whiz and Mr Simon served as an endlessly creative designer of sets and costumes (necessarily dismantlable and transformable, so they could be used many, many times). They started out at an office at a spare room at the Hotel Ramada, which was run by one of their friends. Within a few years, they were being invited to perform in schools and proper theatres, as well as to participate in drama festivals in Singapore, Malaysia, Thailand and Japan. With this attitude of invincibility, the crew managed to achieve a number of firsts in Singapore theatre. 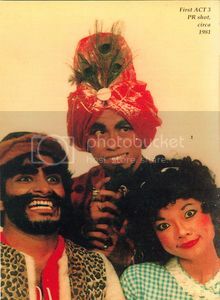 Their “Treasure Island” at Bras Basah Park in 1983 was possibly the Singapore’s first outdoor theatre performance, predating the works of William Teo’s Asia in Theatre Research Centre from 1987 onwards. They also created Singapore’s first musical, “Makan Place”, in 1988, narrowly beating TheatreWorks’s “Beauty World” by a few months. Some of you may also have participated in their Theatre In Education programmes, designed to give kids exposure to theatre – and wouldn’t you know it, a few of those kids stuck around in the theatre world, including actress Annabelle Francis and director Jeffrey Tan. “I don’t want to be immodest, but I think our ‘investment’ paid off,” Simon says. Of course, as the three got older, things changed. There wasn’t a brutal catfight, as many people (me included) thought – it was simply a case of each person wanting to explore different things in their lives. The first to leave was Simon. He moved to Jakarta in 2000, where he’s now a General Manager for the Indonesian office of Fremantle Media. Both his company, ACT 3 Theatrics, and Lim-Yang’s company, ACT 3 International, are still extremely active on the local scene. ACT 3 International gets more press because it does more overseas work (there’s even a branch of the company in Kuala Lumpur), and because it manages the Prudential First Children’s Festival, bringing in children’s acts from places as distant as Norway, South Africa and Peru. Simon hasn’t abandoned drama either. In Jakarta, after filming children singing and dancing at a halfway house, he decided to form them into a mini theatre group that could earn money performing at events. Since then, he’s been recognised by the Singapore International Foundation for his charitable work, training a range of underprivileged youth in arts and life skills. As a theatremaker myself, I’m inspired by the memory of their struggles and triumphs, and the courage it took to walk the unknown path of a career in the arts. On behalf of the generations of Singaporeans who watched their shows, I offer this article as tribute to their work. Find out more about ACT 3 Theatrics here: http://www.act3theatrics.com/, and find out more about the upcoming shows of ACT 3 International here: http://www.act3international.com.sg/.